Shockingly, there wasn't a rain delay anywhere to be found at the 2018 WIAA Spring Baseball State Championships, as it turned out to be a beautiful week for baseball. While there wasn't a rain delay, the action on Tuesday still went plenty late, in large part to Waunakee going 11 innings before outlasting Green Bay Preble 3-1 in a Division 1 state semi-final. Earlier in the day, Waunakee had dispatched Eau Claire North 12-8 while Preble went to extras to top Kimberly 3-2. In the other quarterfinals, Arrowhead out-dueled Burlington 2-1 and Janesville Craig hammered Milwaukee King 8-0. In that evening's late semi-final, Arrowhead beat Craig 2-1 on a walk-off home run by Zak Karrels in the bottom of the seventh inning. In Thursday's championship contest, Derek Lee twirled a gem, limiting Arrowhead to just six hits and one run as Waunakee claimed a 3-1 victory and the program's first title in ten state tournament appearances. Waupun captured the Division 2 state title, shutting out red-hot Jefferson 4-0 for the program's second state championship. Caden Brokhorst pitched the first 6 2/3 innings for Waupun, before loading the bases with two outs. Vaughn Willison then came in to get the final out. In Wednesday's semi-finals, Waupun beat Ellsworth 6-3 while Jefferson run-ruled Mosinee 14-2. Webster made the state tournament in Division 4 last year but went out in the semi-finals. The Tigers qualified for the Division 3 championships this season, spending all year ranked #1. They won a slugfest with Kenosha St. Joseph 14-8 in the semi-finals, setting up a showdown with Saint Mary Catholic in the championship. The Zephyrs had beaten Mineral Point 4-0 in the semi-finals. 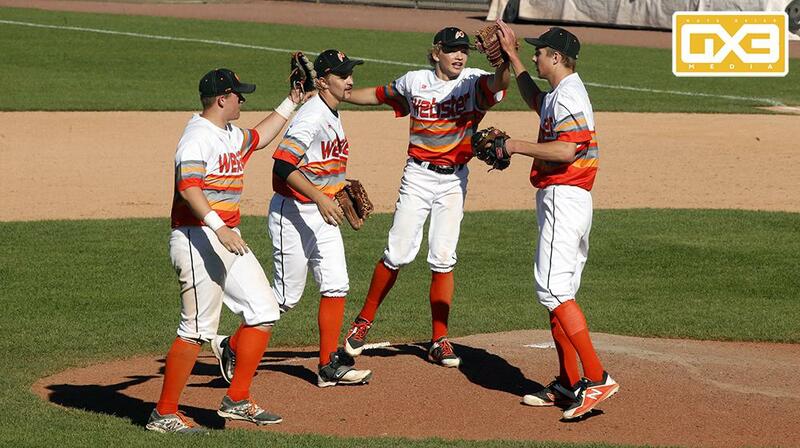 Webster would secure the school's first state title with an 8-2 victory over Saint Mary Catholic. Defending state champion Athens had to rally late to defeat Ithaca 3-1 in the semi-finals. In the other D4 contest on Wednesday, Thorp beat Johnson Creek 6-5 with a rally of their own, scoring two runs in the top of the seventh. The championship contest wasn't the cleanest game anyone has ever seen, as the team's combined for 14 errors, 10 walks, four wild pitches, and a balk, but Athens did enough to escape with a 13-10 victory. Of the 23 combined runs allowed, just six of them were earned. It is the third title overall for Athens, who also claimed the Class C championship in 1982.